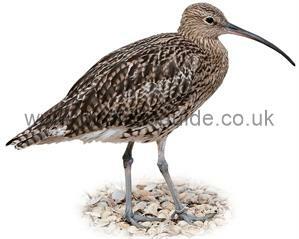 The Curlew is a large bird with long curved bill, brown mottled body and a white underside. It's head and breast is a plain streaky brown. Present on open moorland during the breeding season and migrating to the coast line in the winter. The haunting call of the bird is an iconic sound on winter estuaries and nesting grounds. Breeding birds have become increasingly rare due to increased public access in upland areas. Being Europe's largest wader the Curlew can often be identified by this alone. 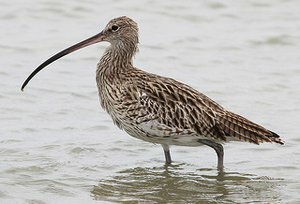 Note the overall plain speckled appearance of this Curlew, lack of dark bands on the birds head indicate that it is a Curlew and not a Whimbrel which is also smaller. 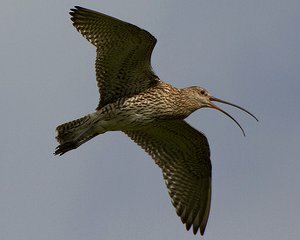 Curlew calling in flight and with young in grassland. 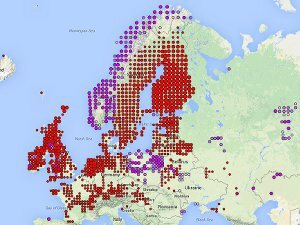 Widespread breeding bird in N and W Europe. Breeds locally throughout the UK but breeding birds have reduced considerably in recent years. Large numbers of winter migrants visit the UK.